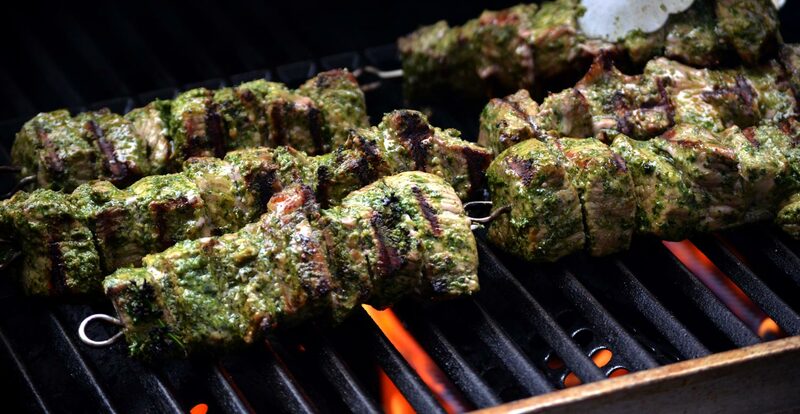 As featured in Gastropost YYC this week in the Calgary Herald – Chimichurri Beef Skewers. They are so easy: blend, marinate, grill, eat. Seriously, it’s that simple! Marinate them a few days ahead so that you can enjoy all the delicious flavour. Plus, then when you actually want to use them you just have to skewer them and throw them on the grill! Easy. Combine the marinade ingredients (except the oil) in a blender. While blending add olive oil until the mixture forms a smooth paste. The idea is to use as little oil as possible, while still keeping the paste together. I usually use about 1/2 cup. Put beef cubes into a large plastic bag. Add the parsley paste and mix around to thoroughly coat. Marinate for 48 hrs. Once marinated, skewer meat on metal skewers (or bamboo skewers that have been soaked in water for at least 1 hr). Oil barbeque and heat to medium-high. Place skewers on barbeque and cook for about 3 mins a side. Cook until skewers are medium-rare or to your desired doneness. Once cooked, remove from barbeque and let sit on plate to rest for 5 mins before serving. This will allow the meat to retain juices and prevent drying-out.